Multiple necklace style options are available on which to sport a handcrafted arrowhead. Also available are Metal Arrowhead Necklaces, Beaded Necklaces, Dreamcatcher Necklaces, and many more. An Arrowhead of your choice is wire-wrapped to create a jewelry charm. Also available here are Metal Arrowheads and a variety of other Charms. 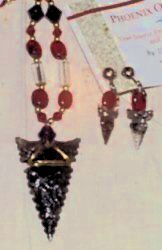 Extremely small arrowheads are a Dr. "Arizona" speciality and can be best showcased with a set of earrings. Also available here are Metal Arrowhead Earrings, Beaded Earrings, Dreamcatcher Earrings, and many more. Closely matched Necklace and Earring Sets can be ordered from various styles, including the various available Metal Charm options. These classy neck-ties are perfect for showcasing larger arrowheads and spear points. 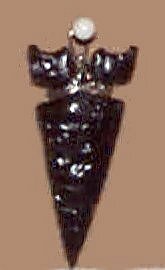 They come attached to leather thongs with decorative metal tips. These pieces are the most economically priced arrowhead jewelry option available. They are perfect for a unique gift that showcases an obsidian arrowhead. These Hair Jewelry options include arrowhead, beaded and feather barrettes, hair clips, hat clips, hair sticks, all of which add a distinctive look to any outfit. A variety of beaded Bracelets are available from Phoenix Obsidian Designs, ranging from stone, clay, and glass beads. 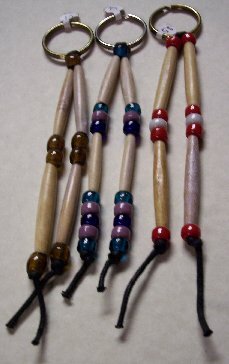 A variety of Key Chains are available from Phoenix Obsidian Designs, ranging from beaded, leather, and even dreamcatcher.